A Reader Writes "When do you think I should start to purchase more stocks?" I do however enjoy receiving mail from readers and if you would like to drop me a line, you can reach me at bobsadviceforstocks@lycos.com. Please remember that I cannot answer all letters that I receive and I cannot address individual investment issues....those are the things you need to use your own professional investment advisor to assist you with. I was wondering when you think I should start to purchase more stocks. Well Chris, let me see if I may be of assistance. I think your professor's suggestion of using more sources is a good one. However, I suspect that the sources that I have been using are probably more than adequate. But more is better :). You said your half of the portfolio consists of "...things that were a bit safer including a blue chip and one of the stocks in your portfolio". If I was your professor, I would inquire why you decided your picks were "safer"? And balancing with a mining stock and a REIT....well, this is getting interesting! O.K., so you have used $300,000 of your $1 million to get started. When should you buy additional stocks? Well, from my perspective starting out at 30% invested is probably way too conservative. I think that 50% invested would be a great place to start. I would of course suggest that you look through my blog and page back through prior posts the last few months....as long as latest earnings are intact...you probably could find a few more stocks of interest. The stocks on my blog run the gamut in size and maybe you would be comfortable with a coupld of them. My buying and selling strategy for a portfolio, that you could certainly adapt for your use, consists of an "internal barometer"....that is I like to use the performance of my own stocks to tell me when I should be buying and when I should be, as I like to say, "sitting on my hands." If you are at 50% invested, I would think you should thus be at 10 stocks. However, if you have only 6 stocks at 50%, well then 12 stocks would be your max. I would suggest that your minimum # of holdings be half of your original # in your portfolio. I hope you are following. Thus, if you start at 6 stocks, you could drop down to three. If you get down to three stocks, I would then replace them if they are sold. If you get up to your maximum # of issues, for instance 12 stocks in this example, then if you have a signal to add a position, simply ignore this signal and instead add to your cash position. O.K. what ARE the signals you are asking? Well, it is simple, as you know, I like to sell losers quickly, and winners slowly. These sales on gains or losses are the signals I use to add to the positions, or add to the cash. There is an interesting book that you might like to discuss with your professor called "How to make $1,000,000 in the Stock Market Automatically!" by Robert Lichello that helped stimulate my own thoughts on this process. He does something rather different, but it is an interesting theory on portfolio management. O.K. back to the signals! First, I have sale points on stocks rising in price. (I actually do this stuff!). What are they? For me, I sell 1/4 of a position remaining each time (1/4 of the shares), at sale points of gains of 30%, 60%, 90%, 120%, then by 60%: 180%, 240%, 300%, 360%, then by 90%....etc. I haven't got to those levels yet...but have sold some shares at 240% gains! These sales on a gain, are signals that the market is in a healthy environment and I add a position (if I haven't reached my maximum # of positions in my portfolio). Now on the downside: first sale is at a loss of 8%...out the stock goes. No matter how long I have held it. I usually give it at least a day :). However, if a stock has risen enough to have sold a portion at a gain, I will do the following: after the first sale (30% range), I sell if it hits "break-even". After that, I sell if it retraces 50% of its highest sale point...that is if I sold a portion at 90% gain, I will allow the stock to retrace back to 45%. I also will sell a stock if there is something fundamentally wrong reported....like bad news. However, I really have been moving away from this, I don't want to have much "subjective" input on my holdings, and would prefer to let the market dictate my actions. Well that is about what I do! I hope you can follow. See what your professor thinks and get back to me. I have enjoyed our correspondence and wish you well in your class! "Looking Back One Year" A review of stock picks from the week of January 12, 2004. Hello Friends! 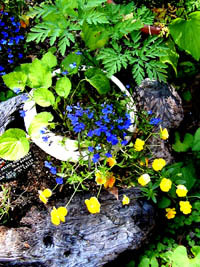 Thank you so much for stopping by and visiting my blog, Stock Picks Bob's Advice. As always, please remember that I am an amateur investor so please consult with your professional investment advisors prior to making any investment decisions based on information on this website! A year ago, last January, I was off on vacation enjoying some scenery with friends and family. I didn't make any posts that week, thus, I shall review the following week's posts next week! Hello Friends! Thanks so much for stopping by and visiting my blog, Stock Picks Bob's Advice. As always, please remember that I am an amateur investor, so please consult with your professional investment advisors prior to making any decisions based on information based on this website! As I posted a few moments ago, I just purchased 400 shares of Perficient (PRFT) in my "Trading Portfolio". Since I have not (as far as I can recall) ever reviewed this stock, I wanted to do so as soon as possible. Perficient (PRFT) as I write, is trading at $9.33, up $.91 or 10.81% on the day. According to the Yahoo "Profile" on PRFT, Perficient "...is an e-business solutions services provider to large and major mid-size companies. It uses a solutions delivery approach called the Enabled Enterprise, which is designed to help clients reach new markets and increase revenues, acquire and strengthen customer relationships, reduce costs and increase productivity and empower employees." 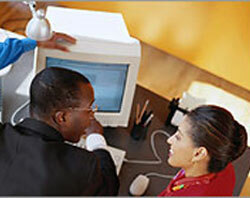 On February 2, 2005, PRFT announced 4th quarter 2004 results. Total revenue came in at $21.6 million, up over 150% from $7.96 million the prior year. Diluted net income per share came in at $.06/share up 100% from the $.03/share the prior year. These results came in despite an increase in the share count from 16.5 million in 2003 to 23.0 million in 2004. How about longer-term? Taking a look at a "5-Yr Restated" financials from Morningstar.com, we can see that revenue has grown fairly smartly from $2.6 million in revenue in 1999 to $45.2 million in the trailing twelve months (TTM). The company was losing money between 2000 $(2.96)/share, through 2002-- $(.53)/share, turned profitable at $.07/share in 2003 and earned $.16/share in the trailing twelve months. Free cash flow while small, has been positive and came in at $2 million in the TTM. Balance sheet-wise, PRFT looks fine with $2.8 million in cash and $14.8 million in other current assets, as opposed to $9.8 million in current liabilities and $2.4 million in long-term liabilities. How about "valuation"? Looking at "Key Statistics" on Yahoo for PRFT, we can see that this is a very small company with a market cap of $179.44 million. The trailing p/e is rich at 50.05 (with the company just turning profitable), the forward p/e (fye 31-Dec-06) is much better (based on estimates) at 27.38, with a 5-yr estimated PEG placed at 1.12. Price/sales is a bit rich at 2.76. Yahoo reports 19.27 million shares outstanding with 13.40 million of them that float. Of these, only 476,000 or 3.55% of the float was out short as of 2/8/05, representing only 1.283 trading days of average volume. We can see that this stock was actually fairly steadily declining in price between November, 2000, when it was trading around $14, down to quadruple bottom in September 2002 at around $.50/share (! ), since then it has been trading higher to its current level around $9. At least for the last two years, the stock has been on a bullish move. So what do I think? Well the stock made a nice move today, but generally I hate stocks under $10 because that 8% loss limit almost always (!) makes me stop right out of a particularly good stock for no particular reason :(. However, earnings were very strong, revenue growth is solid (how much from acquisitions though ? ), valuation is reasonable, last five years shows steady growth, cash flow is positive, the balance sheet is good, and the technicals look just fine. Anyhow, I liked it enought that I DID buy some shares! Thanks again for stopping by! I hope all of this discussion is helpful to you and I really enjoy your comments and emails! You can write me at bobsadviceforstocks@lycos.com. Hello Friends! Thanks once again for stopping by and visiting my blog, Stock Picks Bob's Advice. As always, please remember that I am an amateur investor, so please consult with your professional investment advisors prior to making any investment decisions based on information on this website. That nickel was sure burning a hole in my pocket! A few moments ago, after perusing the list of top % gainers on the NASDAQ today, I came across Perficient (PRFT), a stock that I have not reviewed here before. It IS under $10, so I am a bit cautious about this one, but the numbers looked great and I bought 400 shares at $9.35 a few moments ago. 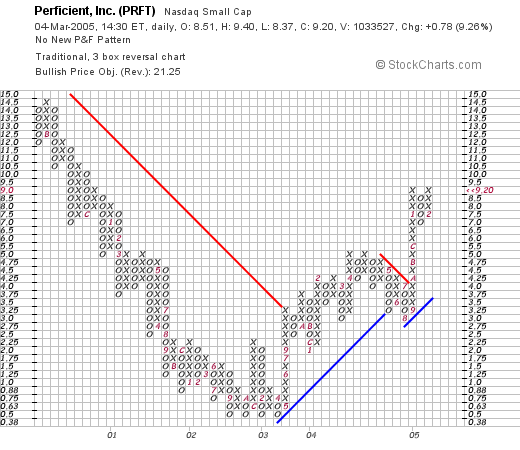 As I write, PRFT is trading at $9.26..so I am losing a few cents already :). In any case, I will try to update PRFT with a full report later today or this weekend! Thanks again for stopping by! If you have any questions or comments, please feel free to email me at bobsadviceforstocks@lycos.com. Hello Friends! Thanks so much for stopping by and visiting my blog, Stock Picks Bob's Advice. As always, please remember that I am an amateur investor, so please consult with your professional investment advisors prior to making any investment decisions based on information on this website! I got a chance to check my "Trading Portfolio" a few moments ago, and was pleased to learn that another of my stocks had hit a sale point on the upside. This time, Quality Systems (QSII), which as I write is trading at $86.70, up $4.02 or 4.86% on the day, hit a sale point. For those of you who might be new to my "strategy", I have a very disciplined (usually) buy and sell strategy. I sell my losers quickly at (8)% losses, and sell my winners slowly. I sell portions of winners (1/4 of my existing position) at set sale points of 30%, 60%, 90%, 120%, and then by 60% intervals at 180%, 240%, 300%, and 360%....I haven't had any with this strategy at the upper end of this range...but at that point would go by 90% intervals selling 1/4....etc. Moments ago, as I wrote, I sold 22 shares (of my 90 share position) of QSII at $86.72/share. I had originally purchased Quality Systems (QSII) at a cost basis of $31.00/share on 7/28/03. I had sold portions of QSII four times already (! ), being that this was my fifth sale, I had been waiting for a 180% gain level. Based on my $31 purchase price, I had a gain of $55.72/share or 179.7%, hitting my sale point! Another thing. Since I am under my 25 position goal for my portfolio, I use a sale at a gain in one of my existing positions as a "green light" to add a new position. That nickel is ALREADY burning a hole in my pocket! Again, thanks so much for stopping by! If I find anything and purchase a new position, I will keep all of you posted. If you have any comments, questions, or words of encouragement, please feel free to email me at bobsadviceforstocks@lycos.com! Hello Friends! Thanks so much for stopping by and visiting my blog, Stock Picks Bob's Advice. As always, please remember that I am an amateur investor, so please consult with your professional investment advisors before taking any action based on information on this website! Lately, with my entries, I have been trying to explain my rationale for picking stocks...I hope that is helpful and that you feel free to comment or ask questions! My first place for looking for new stock ideas is the list of top % gainers on the NASDAQ. 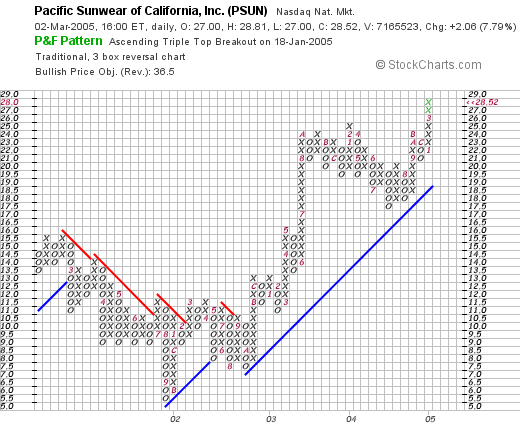 Today I noticed that Pacific Sunwear (PSUN) was on the list, and in fact, PSUN closed at $28.52, up $2.06 on the day or 7.79%. I do not own any shares nor do I have any options on this company. It has been my impression over the years that stocks that are making a strong move upward on any particular day, may, if they have additional characteristics, be the stocks that move higher over the intermediate and longer-term. According to the Yahoo "Profile" on PSUN, PacSun "...is a specialty retailer of everday casual apparel, accessories and footwear designed to meet the needs of active teens and young adults in the United States. 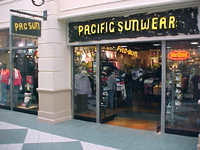 The Company operates three primarily mall-based chains of retail stores under the names Pacific Sunwear (PacSun), Pacific Sunwear (PacSun) Outlet and d.e.m.o. PacSun and PacSun Outlet stores specialized in board-sport inspired casual apparel, footwear and related accessories...."
My next "screen" for a stock involves the latest quarterly result. I am looking for a strong report with both earnings and revenue increases. On March 1, 2005 (yesterday after the close of trading), PacSun announced 4th quarter 2004 results. It was this announcement that provided the impetus to move the stock higher today! Total sales for the quarter ended January 29, 2005, increased 16.2% to $379.7 million from $326.8 million last year. Company same store sales were up a solid 5.1% overall. Net income for the quarter increased 19% to $40.9 million, compared with $34.5 million the prior year. On a per share basis, this was a 26% increase to $.54/diluted share, from $.43/diluted share the prior year. Actually, for a retail investment, I am looking for three things: increase in sales, increase in "same-store" sales, and increase in earnings. PacSun passed this test with flying colors! The next thing I look for is consistency of results. That is, was the latest quarter a "fluke" or has this company been performing like this over the last several years. A good friend of mine introduced me to the Morningstar.com website, and I haven't left since! Within this site, I like to look under "financials" and use the "5-Yr Restated" financials portion. For PSUN, this is located here. On Morningstar.com, we can see the beautiful ramp-up of revenue from $.4 billion in 2000 to $1.2 billion in the trailing twelve months (TTM). Earnings have been a bit more errratic, increasing from $.49/share in 2000 to $1.28/share in the TTM. Next, I check the "Free Cash Flow". Think of this as the actual cash that is being generated by this business venture. For PSUN, this was a negative $(35) million in 2002, $36 million in 2003, $111 million in 2004, and $88 million in the TTM. Finally, just below that portion is the Morningstar Balance Sheet assessment. Not being an accountant, I do know that assets are better than liabilities (!). And in addition, current assets are $'s that are available now or in the next 12 months, and need to be used to offset current liabilities. In this case, we can see that PSUN has $84.5 million in cash and $238.1 million in other current assets. This is plenty to cover both the $119.6 million in current liabilities and the smallish $37.0 million in long-term debt. Thus, this looks nice as well! My next screen is to gather some basic information about "valuation". For this I turn to the "Key Statistics" on PacSun. Here we can see that this is a mid-cap stock with a market capitalization of $2.12 billion. The trailing p/e is great (imho) at 20.55 and the forward p/e is nice at 17.60 (fye 31-Jan-06). Nicer yet is the PEG ratio, which compares the P/E to the growth rate. For PacSun, the 5-yr estimated PEG is 0.84...anything under 1.0 is a nice value! The price/sales also isn't too bad at 1.79. Yahoo reports 74.24 million shares outstanding with 71.00 million of them that float. There are 3.35 million shares out short as of 2/8/05, representing 4.72% of the float or 2.255 trading days of volume. In my analysis, for what it is worth, I have been using 3.0 trading days of volume as significant. So this isn't (imho) a large factor for PSUN. No dividend is paid and Yahoo reports a 3:2 stock split on 9/8/03. Here we can see a stock that was peaking in February, 2001, around $16.00, then dropped down to $6.00 in September, 2001, but since then has been climbing steadily and in a very strong fashion to its current level of $28.52. The chart looks wonderful to my amateur eyes! So what do I think? Well this is a very pretty picture of a stock. The companty made a nice price move today on great earnings results and solid same-store sales numbers. The revenue has been growing especially steadily, and is often the occurrence, earnings have been a bit more erratic, yet the trend is still solidly higher. Free cash flow is positive, the balance sheet is solid, valuation is reasonable (imho), and the chart looks great! In fact, if I had some money (lol) or if my "system" indicated it was time to add a position, I might just be buying some PSUN right here. I think you could do far worse. Thanks again for stopping by! If you have any questions, comments, or words of encouragement, please feel free to email me at bobsadviceforstocks@lycos.com. I have had a couple of letters recently asking me again how I pick stocks...and bemoaning my recent sparsity of new stock picks. So today I dedicated myself at finding a new stock pick and hopefully using that selection to demonstrate the how and why of my selection methods. I hope that this is helpful for you. After many years of buying stocks, I came across the observation that it may be possible to make money on a stock investment by purchasing stocks on a day that they are making a large move in an upward (!) direction. Sort of banking on a continued momentum in stock price after a single day of outperforming most other issues. But this is only my first screen! There are a lot of places to look for large percentage gainers in the market. I have taken to using the Money.cnn.com site but I have also utilized the lists on USA Today as well. Frankly, any source that provides a list will suffice. For this example, I found a candidate for inclusion today on the money.cnn.com list of top % gainers on the NYSE. I have lately tried to stay with stocks that are near $10 or higher, as the lower-priced stocks tend to be a bit more volatile and I end up selling them quickly on their pull-backs. Alamo Group (ALG) made the list today, and as I am writing is trading at $24.80/share, up $.95 or 3.98% on the day. I do not own any shares nor do I hold any options on this equity. When I first saw the name, in fact, I thought it was the rental car company (see what I know! ), and was surprised to find that it was an agricultural implements company. In fact, turning to the Yahoo "Profile" on Alamo Group, we can see that this company "...is a manufacturer of equipment for right-of-way maintenance and agriculture such as tractor mounted mowing and other vegetation maintenance equipment, street sweepers, agricultural implements and related after-market parts and services." My next criterion to assess a stock investment is to check the latest quarter's results. Basically, I am just looking for a quarter in which both revenue and earnings are growing. My stock market selections are basically what I would call high "quality" stocks. We can go back and forth on what the definition of "quality" really is. In my opinion, quality is about consistency of corporate performance. I want to fill my portfolio with consistently growing companies...both growing their earnings as well as their revenues! Usually I can find this information right on Yahoo under "headlines". However, Alamo Group is a little harder to find...I would rather read a report of earnings than struggle with a 10-Q. I usually go over to the homepage of the company and look for their news or earnings releases. That is where I found the latest quarterly report for ALG. On November 4, 2004, Alamo Group (ALG) announced their 3rd quarter 2004 results. Net sales for the quarter ended September 30, 2004, increased 24% to $88.0 million from $70.7 million the same quarter the prior year. Net income was $4.2 million or $.43/diluted share, a 59% increase over the prior year's $2.6 million or $.27/diluted share. The report does note that results were affected by an acquisition of Rousseau Holdings, however, excluding the effect of that acquisition, revenue was still up 17% and earnings were still up 65% over the prior year. Well the latest quarter was very nice! However, how about a longer-term view on this company? Have they shown the ability to continue this growth? For that I turn to Morningstar.com, and fortunately, the information that I use is still available without charge on their website. The information I like to review is the "5-Yr Restated" financials on Morningstar.com on ALG. First, looking at the series of bar-graphs we can see that revenue has increased extremely steadily from $176.6 million in 1999 to $325.0 million in the trailing twelve months (TTM). Next, the earnings, which have been a bit more erratic, have improved from $.63/share in 1999 to $1.30 in the TTM. In fact, they have steadily improved after dipping to $.65/share in 2002. How about "Free Cash Flow"? This is found under the earnings chart, and shows that ALG had $1 million in free cash flow in 2001 and although erratic, stayed positive, and in the TTM had $14 million in free cash flow. Not being an accountant, in my simple understanding the free cash flow is the actual cash that is being created or consumed by the entity. In the old dot-com era, these little firms would be loaded with cash and talk about their "burn rate" which I assume was their amount of negative free cash flow. Probably more complex than that, but it works for me! Finally on Morningstar.com, I like to check a basic balance sheet. What do I look for? Simply put, I would much rather see assets outweigh liabilities. And more importantly, current assets especially cash, outweighing current liabilities. For ALG, we can see that they have $7.1 million in cash and $153.7 million in other current assets, which is plenty to cover both the $51.8 million in current liabilities AND the $19.7 million in long-term liabilities more than two times over. This looks just fine to me! My next stop is to look and see if I can get some "valuation" issues defined. My approach tends to be eclectic, that is, I do not want to limit myself to momentum, valuation, or technical approaches...rather why not try to utilize all of these perspectives to try to identify a "quality" investment? For this, I refer back to Yahoo "Key Statistics" on ALG. Here we can discover that this is really a small company with a market capitalization of only $241.50 million. The trailing p/e is reasonable at 19.06. There aren't any forward p/e's, I assume the company is too small to have many analysts following, but the price/sales at 0.71 is also cheap being under 1.0. According to Yahoo there are only 9.74 million shares outstanding with only 2.70 million of them that float. There are only 12,000 shares out short as of 2/8/05, representing 0.44% of the already small float or only 0.3 trading days of volume to cover. I arbitrarily use 3.0 trading days as a cut-off for a significant level of short interest. Above that is bullish in my humble opinion. Yahoo also shows that the company pays a small dividend of $.24/share yielding 1.01%. No stock splits are reported. While I am not requiring stocks to have a dividend, the presence of a dividend just makes that investment that more attractive! Bottom line, this is a gorgeous graph which goes all the way back to April, 1999, when the stock price bottomed out at around $7.00 and shows a steady appreciation in stock price to the current levels around $24.80. The stock basically looks great if not a bit ahead of itself. So what do I think? Putting all of this together I find a series of "passing marks" for Alamo Group (ALG) in my evaluation. What were they? In summary, a nice price move today, a solid earnings report, a very pretty five year picture of earnings and revenue growth (with earnings being a little less consistent), solid free cash flow, a solid balance sheet, a dividend, reasonable valuation, and a nice chart! I am not buying any shares because I am simply not in the market to buy anything. That is, I wait for a buy signal from my own portfolio which if I were selling a portion today at a gain, I probably would be putting in an order for some shares of this stock. On the downside, the company is very small and may be subject to volatility. But thus far, the stock has been performing quite steadily in an upward direction! Thanks again for stopping by! I hope that my explanation was not too detailed...and that you bore with me. If you have any questions, comments, or words of encouragement, please feel free to email me at bobsadviceforstocks@lycos.com. A Reader Writes "Do you have any tips?" Hello friends! Thanks again for stopping by and visiting my blog, Stock Picks Bob's Advice. I had another letter today (!) again asking about stock advice. As I point out many times all over this website, I am an amateur investor and am not prepared to give individual stock market advice to individuals. However, there are many stock market ideas all through the blog that you can review with your investment advisors....and I am sure some will turn out to be great stocks over time. However, more important than any picks, I want my readers to appreciate my techniques for picking stocks, and hopefully, they too will be able to pick stocks just as easily. I have never purchased stock before but am very eager to do so in the near future. I admit that I am a little nervous in doing so because as you probably know stocks can be very unpredictable. Do you have any tips for me and can you reccomend any certain stocks to buy? Well Xanthe, I hope that answers your question. My tips for you are to think well before buying any stocks, you can adopt my methodology....you can read my prior post...or take a look at the dozens of stocks listed here! Good luck and let me know what you decided to do! A Reader Writes "I would appreciate any kind of guidance." Hello Friends! 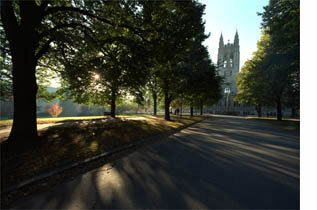 That beautiful picture is a shot of Boston College from the BC Homepage. What a beautiful school and a wonderful city as well. Thanks so much for stopping by and visiting my blog, Stock Picks Bob's Advice. As always, please remember that I am an amateur investor, so please consult with your professional investment advisors prior to making any decisions based on information on this website. learning anything here and would appreciate any type of guidance. Chris, I hope that I may be of help to you! I hope that as a blogger I can provide you with more direction rather than misdirection. I would like you to pick the stocks for your portfolio. You are welcome to any of mine :). But it is important that you understand why you might pick a stock...and see if your philosophy of investing is similar to mine (and your group's). The first thing I like to do is to peruse the list of top percentage gainers. I have found over the years that within those lists are stocks that are worth considering for investment. You will have to see if that approach works for you! Next step is to go to the latest quarterly results. 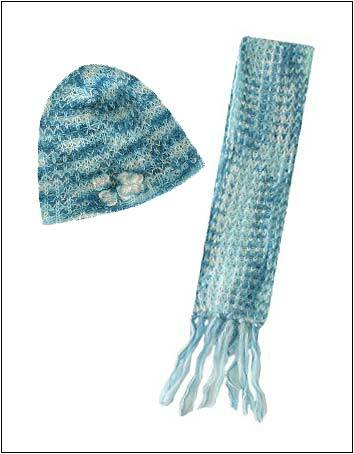 You can find these over at Yahoo finance. Let me know if you have a problem, just scan through the headlines and see if you can find the latest quarter's results. Basically, what I am looking for in the latest quarter are two basic things: growth in revenue AND growth in earnings. In addition, if the company provides some positive guidance, like raising guidance for future results, well that is "gravy". Generally, at that point, I will go to Morningstar.com and check the "5-Yr Restated" financials. What am I looking for? Basically, growth in revenue...as steady as possible, same for the earnings. In addition, Morningstar gives information regarding free cash flow, and I insist on this being positive, and if there is a positive trend as well, then that is noted! Finally, on the lower part of the page is a balance sheet. Not being an accounting wiz, I simply look to make sure that the cash and current assets are greater than the current liabilities and that the long-term liabilities aren't too burdensome. Next step, I like to touch on "valuation"....you can see this isn't my number one screen. For this, I generally click back on Yahoo Finance to "Key Statistics" for the stock I am researching. What do I look for there? I like to at least look at the market cap of the stock, the P/E, the PEG, and a number on the Price/Sales. I report on the number of shares, and see if there are a lot of sales out short....if there ARE a lot of short sellers, well, on an up move there might be a bit of a squeeze...as these shorts try to cover. 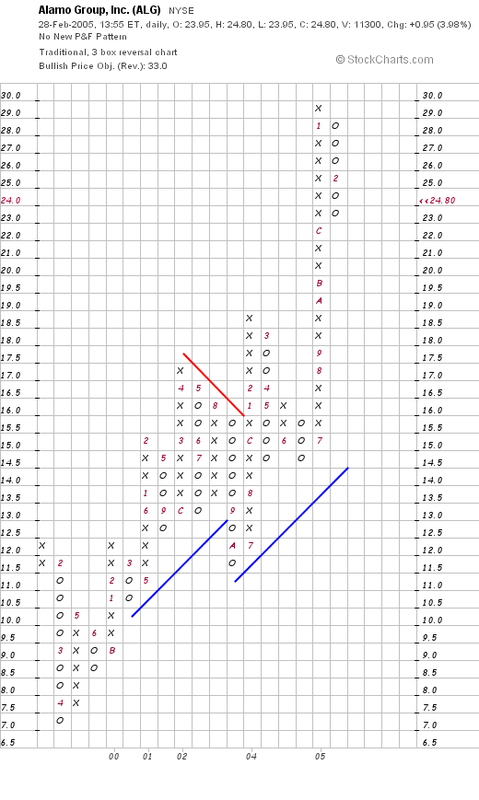 Finally, I go over to Stockcharts.com and look at a "point & figure" chart....I have found that these are helpful in getting a good feel for long-term trends as the columns of climbing 'x's' battle with the declining 'o's'. PHEW...by the way, that's a photo of Faneuil Hall, one of my favorite tourist traps in the Boston area. What do I mean? Well, first of all, let's set a fixed maximum of stocks you are going to hold in this "phantom" portfolio. If you do it like I do it, you might consider 25 issues. First, start at 50% invested. That is, start with 12 or 13 issues and 50% of your cash utilized. Pick stocks that fit the criteria I have suggested...you can pick recent stocks that I have written about, or find new ones tomorrow off the top % gainers list....just follow my screening techniques...they really are just common sense. Next, sell any stock that drops 8%. Don't replace that stock with another issue unless you have a "buy signal" from the rest of your holdings. What I like to use is a sale at a gain. Now, when do you sell at a gain? Well, for me, I am trying to sell my losers quickly and sell my winners slowly. I hope you follow. I actually do this in practice. Next on the downside, if I have sold a stock once (30% gain), then on the way back down, I sell at break-even instead of waiting for an 8% loss. On stocks that I have sold at higher levels of gains, I let the stock retrace 50% of the highest gain before unloading the shares. I will sell if clearly there is bad news....but generally, I like to try to avoid my own judgments, and let the price of the stock determine my action. There are LOTS of stock blogs out there hyping all sorts of stuff. My methodology is very unsexy in my humble opinion, but I believe it is pretty common sensical....(is THAT a word? )....anyhow, I hope my discussion is helpful. Please write back and let me know what you decided and how things work out. A Reader Writes "Will PMTI split?" Hello Friends! Thanks so much for stopping by and visiting my blog, Stock Picks Bob's Advice! As always, please remember that I am an amateur investor, so please consult with your professional investment advisors prior to acting on any information on this website. just wanted to email you to say i have some stock in pmti aswell, and just curious to know if you think the stock will split and if so what should i be looking for? Well Rick, first of all, I am glad that you own some PMTI, which is Palomar Medical Technolgies. On February 10, 2005, PMTI reported 4th quarter 2004 results. Fourth quarter revenues jumped 63% to $16.4 million from $10.1 million the prior year. Net income came in at $5.4 million or $.29/diluted share, up from $1.0 million or $.06/diluted share the prior year. These were great results and the stock has been strong since then. You can see how strong this stock has been performing! Looks like it broke down a little back in June 2004, when it dropped from $21 to $11.50. 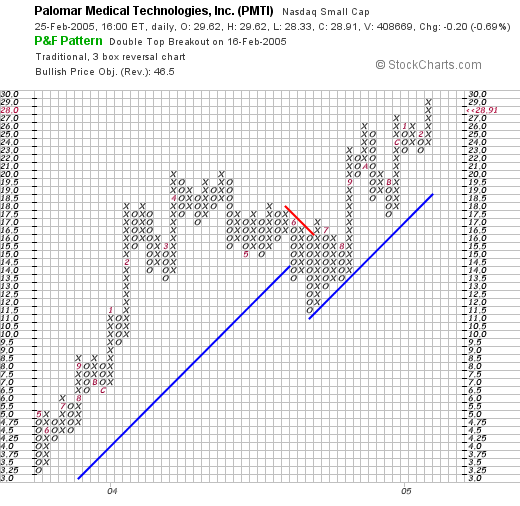 However, the stock has been strong since that time, staying above its support line. When do I think it will split? I really don't know. It doesn't really affect my actions on a stock. I just wait until it hits percentage gain points and sell portions of my holdings.....so I don't really know WHEN it will split, or if it will. What should you be looking for? That is certainly up to you. As for me, I sell portions at gains and then raise the downside stop each time...that is raise the level at which I would sell the remaining position on a retrenchment of the stock. I frankly don't think I have answered your question, so if you have additional comments, please post them here or email me at bobsadviceforstocks@lycos.com.